The Lodger. Gainsborough Pictures 1927. I got this in a box set of early Alfred Hitchcock films, which indicated it was Hitchcock’s first thriller. I’ve seen it described elsewhere as when Hitchcock came into his own. But I don’t know much about it beyond that it’s about a serial murderer and it’s silent. I haven’t covered many silent films. I don’t dislike them, but they don’t usually attract me unless it’s something historically significant like The Birth of a Nation. Lack of color often enhances the tension in a movie, but I’m not sure if lack of sound will do the same or be a barrier to connecting with it. I’m expecting it to help though. I have a hard time picturing a Hitchcock film without sound though. He does a lot of advanced camera and narrative techniques, and when I think of technique in the silent era, I think more about pioneering the basics than doing anything that can impress in its own right. I recognize this is patronizing, and I’m hoping this film will defy that notion. The streets of London are plagued by the Avenger, a serial murderer who leaves another dead girl with blonde curls every Tuesday night, along with his calling card. A witness at one scene described seeing a man with his face all wrapped up, the only lead on his appearance. While most blonde fashion models fearfully cover or dye their hair, Daisy Bunting scoffs at such worries, even as the killings move closer to her home. Her parents run a lodging house, and Joe, a police detective, comes by frequently courting her. Daisy’s parents rent their loft to a reclusive stranger who volunteers a month’s rent up front and keeps to himself. 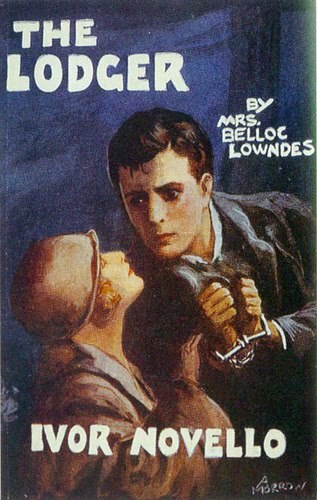 As he arrived with his face covered with his scarf, asked to have all the paintings of blondes removed from his room, and at least once crept out late at night, the Buntings grow concerned that this reclusive stranger might be dangerous, and more alarmingly, an attraction is growing between Daisy and this man. Coming from talking media to a silent film is a bit of a challenge. One thing it’s easy to forget is how much talking happens without dialogue cards. These are moments where what is said isn’t important and can be easily guessed. The acting carries the story more than the words. While that’s certainly still true for sound pictures, it can be a tough adjustment from leaning on the language to get the idea across to being required to fill in the gaps. Once in the proper mindset, it’s better than stopping for a card every few seconds for the entire film. The case against the lodger was handled with an irritating lack of subtlety. From the moment he first appeared until the Buntings begin talking about their suspicions, every time we see him, the movie is practically shrieking this guy is 1000% the Avenger. I’m quite familiar with the obvious first choice being a misdirection, but the first half hour or so was insultingly over the top in pointing out just how suspicious the man is that there was never any doubt in my mind about him. Dramatic irony in having the audience know what the characters don’t know is supposed to be a source of tension, but the story only got interesting when the characters finally caught up with what the movie had already made quite clear. The camera-work and editing are much more developed than I expect from a silent film. This is quite late in the silent era (The Jazz Singer was released the very same year), so it’s going to be more sophisticated than I generally think of the medium, but The Birth of a Nation was only made twelve years earlier, and it’s significant for developing the beginnings of narrative editing. This has many of the techniques Hitchcock would use to great effect later, though some of the point of view shots are clumsy and the 180° rule is violated in places that don’t appear to be for unsettling effect. However, the camera is also frequently used in unexpected ways that do work extremely well. At one point, for example, the stranger is shown pacing from a vantage point beneath the floor. It’s a simple, yet unusual and striking effect. Once I was able to connect with the story, it was at least as engaging as any sound film. The characters are a bit broad, but their story is not. They exist in a film that still works compellingly almost 90 years later.